One of the most popular ways to experience the Rocky Mountaineer is to combine the legendary rail journey with an Alaskan Cruise. By booking a Rocky Mountaineer package which begins or ends with a cruise to Alaska, passengers can discover both the wonders of America and Canada’s diverse landscapes and Alaska’s dramatic scenery, rich wildlife and epic seascapes. You won't find these deals anywhere else! Get the best prices on Alaska Cruises with Rocky Mountaineer at Cruise Nation! 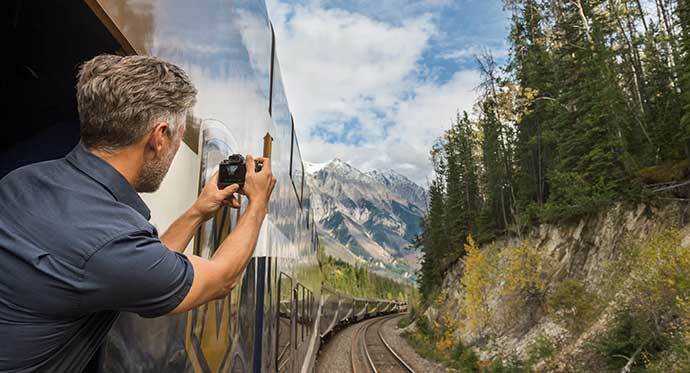 Named by National Geographic as one of the “World’s Greatest Trips”, the Rocky Mountaineer offers travellers the chance to combine ocean and rail routes to create their dream journey. With four unique rail routes - the historic “First Passage to the West”, “Journey through the Clouds”, “Coastal Passage” and “Rainforest to Gold Rush” - to choose from, as well as dozens of cruises departing and arriving from Vancouver and Seattle, passengers can design a trip that ticks their must-see, bucket-list destinations. Of the Rocky Mountaineer’s four routes, none is more popular or legendary than the “First Passage to the West” railway line. Uniting Canada’s East and West, the famous route takes passengers through the magnificent Canadian Rockies, the iconic Spiral Tunnels and the historic Craigellachie – where the final spike on the Canadian Pacific Railway was placed. The only running passenger service on the historic “First Passage to the West” route, the Rocky Mountaineer passes by spectacular mountains, lush forests and mirror-like lakes, offering guests views unreachable by any other form of transportation. Pass over the iconic Cisco Crossing, marvel at the unique Black Canyon with its towering shale wall, hear legends of witches and people turned to stone as you glide past the Hoodoos, gaze at the turquoise waters of the Columbian River’s Kinbasket Lake and be awed by the scale of Castle Mountain, standing at over 9,000ft. Running from Vancouver to Banff, via Kamloops and Lake Louise, the “First Passage to the West” combines the very best city, ocean and mountain scenes, with a fascinating history, world-class cuisine and exceptional service. With two luxury classes to choose from, it’s easy to see why the Rocky Mountaineer is one of the most awarded rail services in the world. As well as eight World Travel Awards, including “World’s Leading Travel Experience by Train” and “World’s Leading Luxury Train,” the Rocky Mountaineer has also been named by Lonely Planet as Canada’s No.1 “Best in Travel 2017”. Guests can pick from either the GoldLeaf Service or SilverLeaf Service, each offering incredible views, first-class service and delicious cuisine. The ultimate luxury train experience, the Rocky Mountaineer’s GoldLeaf option allows guests to soak in the spectacular landscapes, whilst being entirely spoiled by first-class service and exquisite cuisine. In GoldLeaf Service, gourmet meals created by Michelin-trained, Executive Chefs are served in an elegant dining carriage. Each dish is created fresh, using locally sourced products inspire by the Pacific Northwest. Full glass dome windows offer spectacular panoramic views of the mountains, rivers and lakes, whilst GoldLeaf guests can take in the fresh air from the outdoor viewing platform. Luxury hotel stays offer deep and trouble-free sleep, and those who wish to indulge in an even more luxurious experience can upgrade to the GoldLeaf Deluxe Service at night for superior rooms and views. Travelling onboard the single-level, glass dome coach of the Rocky Mountaineer’s SilverLeaf Service is an experience that will stay with you for a life time. Watch uninterrupted views of the passing scenery as the SilverLeaf staff take care of your every need, with gourmet snacks and complimentary beverages. Delicious meals created by the Rocky Mountaineer team of award-winning chefs are served to your directly at your seat, meaning you never have to miss a moment of the stunning landscapes. Each night, relax with the knowledge that you’ll be transported to a comfortable hotel, featuring on-site dining or situated near local restaurants. Experience the wild beauty of Alaska before or after your luxury train journey, with one of our Rocky Mountaineer Rail and Cruise packages. With one of the combined “First Passage to the West” and Alaska cruise packages, you’ll discover the highlights of both the incredible Canadian Rockies and Alaska’s beautiful coast. With pre and post tour cruises available, take in sights including the dramatic Inside Passage, the UNESCO World Heritage Site Glacier Bay National Park and the mammoth Mendenhall Glacier. Alaska’s unique landscape and epic scenery has long-appealed to adventurous travellers, but with an increase in luxury cruises and cruise and rail packages, you can now experience this fascinating part of the world with first class service and style. Wildlife enthusiasts will have plenty to watch out for on the land, sea and air - with brown bears, whales and bald eagles amongst some of the state’s most treasured animals. Take in the rugged beauty of the outdoors before returning to your luxury stateroom for an evening of comfort and uninterrupted sleep. Whether you choose to cruise to Alaska first, before boarding the Rocky Mountaineer’s “First Passage to the West” route or add on a relaxing, luxury cruise at the end of your rail journey, by booking one of our rail and cruise combos, you are guaranteed to experience an unforgettable trip of a lifetime.